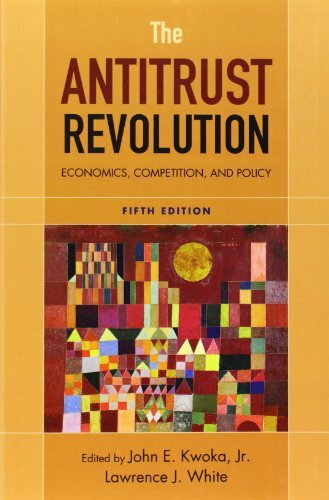 he Antitrust Revolution: Economics, Competition, and Policy, Fifth Edition, examines the critical role of economic analysis in recent antitrust case decisions and policy. The book consists of economic studies of twenty-one of the most significant antitrust cases of recent years, twelve of them new to this edition and nine updated from the fourth edition. These cases include alleged anticompetitive practices by Visa and MasterCard, Microsoft, and Kodak; mergers—proposed or consummated—by Staples and Office Depot, PSEG and Exelon, EchoStar and DirecTV, and Heinz and Beech-Nut; and other competitive issues such as predatory pricing in the airline industry, "reverse-payments" in settlements of patent litigation, the use of bundled rebates by dominant firms, exclusive dealing, and retailer-instigated restraints on supplier sales. New overview essays precede the four sections of the book: Horizontal Structure; Horizontal Practices; Vertical and Related Market Issues; and Network Issues. Commissioned and edited by John E. Kwoka, Jr., and Lawrence J. White, the case studies are written by prominent economists who participated in the proceedings. These economists were responsible for helping to formulate the economic issues, undertake the necessary research, and offer arguments in court. As a result, they are uniquely qualified to describe and analyze the cases. Fully updated with the most current examples, this volume provides detailed and comprehensive insight into the central role that is now played and will continue to be played by economists in the antitrust process. The Antitrust Revolution, Fifth Edition, is ideal for undergraduate and graduate classes in industrial organization, government policy, and antitrust/regulation law and economics. It is also a useful reference book for lawyers and economists-both academics and practitioners-who are interested in the types of economic analyses that have been applied in recent antitrust cases. A companion website featuring cases from the previous four editions is available at www.oup.com/us/antitrustrevolution. Kwoka, John E., White, Lawrence J.
Kwoka, John E.; White, Lawrence J.